To copy Ms. Nowizee from last year, I want to share my Geometry Concept List. This was the first year of Standards Based Grading in Geometry, and before seeing the end of the year results, I’d give it a B (more to follow). The hard part was designing the list so that each concept was not too big and not too small. If the concept covered too much stuff, then it was difficult for the students to nail down what they knew, and what they didn’t. If the concept was too small then it could make it too obvious to the student how to solve a problem. For example take the Circle topics — please. A concept that is too small is Exterior Angles in Circles, which only essentially has one formula to apply. A concept that is too large would be Circles (circle angles, circle segments, circle proofs). The student may know the circle angles cold, but be totally lost on the proofs. 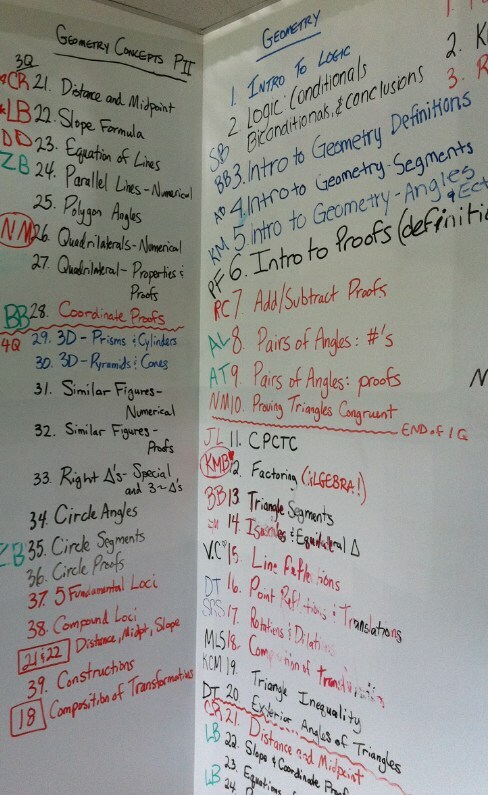 As the title of this blog would suggest, I’ll keep changing this list as I teach Geometry. Sadly (or not), for the first time in 6 years, I won’t be teaching Geometry next year. I have another section of Computer Programming, and for the first time a section of Pre-Calc Honors. So the list will stay as it is until I teach it again. No more delay, here you go: link. Here is the wall in class where we kept track of the concepts. Was really nice having them up at all times. Hm. This looks totally reasonable but has like half the items as my list. I find when I try to make the items less fine-grained, my questions end up having multiple parts, and then they are harder to grade. Do you ever have that problem?